The Burnham boiler for my forced hot water heating system has been making a lot of noise. So I decided to drain the boiler and refill it to the manufacturer’s spec of 12 psi with the water cool. 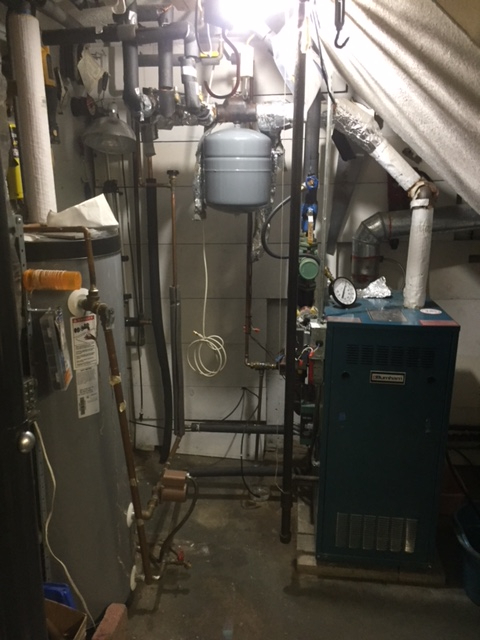 About two days later the pressure relief valve opened, and I discovered that the boiler pressure rose to almost 30 psi from the starting pressure of 12 psi. I repeated the process(drain, re-fill, set pressure to 12 psi,) three or four times all with the same result. Can you tell me the cause of this rise? This problem is disconcerting because the boiler could go into an over pressure condition for prolonged period of time if I go on vacation for a week or two. Can you tell me how this happens and how do I fix the problem? This problem is disconcerting because the boiler could go into an over pressure condition for prolonged period of time if I go on vacation for a week or two. 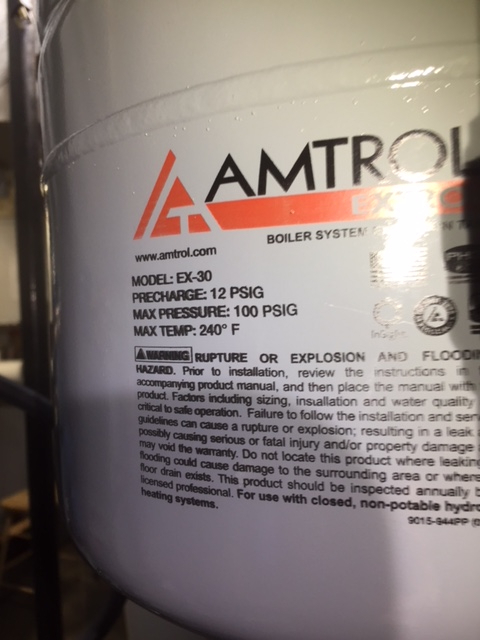 What type of expansion tank? Could be water logged. Do you have an indirect, or hot water coil for domestic hot water? Could be a leak in the coil allowing the domestic side pressure to fill the heating side system making pressure rise. Is the auto feeder for make up water open, or closed after filling? If open all the time possible the pressure reducing valve is bad allowing make up water to enter the system. I very much appreciate your taking an interest as this is a scary problem. And you ask good questions. Let me answer them one at a time. The expansion tank was suspected and replaced with a new one a week ago. The street feed to the system has been shut off so the auto makeup valve is not involved. In addition, during the overnight hours I shut off the house main valve off but to no avail. I have a heat exchanger coil bolted to the wall of the boiler and so a leak in the coil into the boiler could cause the pressure to rise. But since I shut the house main overnight and the pressure still rises, I would think that a leaky coil can be ruled out. Lately the pressure has dropped as dramatically as the rises. Preesure could drop 10 psi to 15 psi. It sounds like the expansion tank that you installed is too small for the system and/or not properly pre-charged. More info is needed, such as: the tank model, water content of the system, btu output of the boiler, type of emitters, etc. Posting some pics of the boiler and it's near piping would help. thank you for interest in my problem. 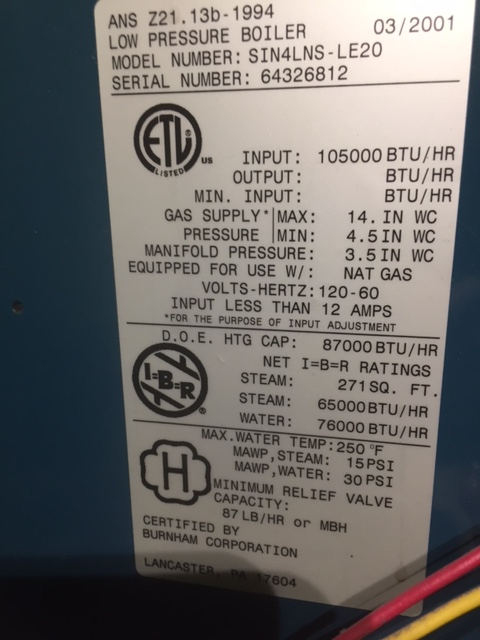 See attachments with photos of boiler specs, expansion tank specs, and a sketch of my piping in the vicinity of the boiler. please note that the piping diameters an some minor details have not be verified. I am new to HH.com and so i hope my attempt to attach photos is successful. When you shut off the house main did you bleed off residual pressure? What type of emitters do you have? I also don't understand why your drawing shows that you have circulators on both the supply and return for each zone. It could still be the indirect. Unless you isolated the supply and return for the indirect and the pressure still rose. When you shut the main off, there is still street pressure in the tank and the recirc line. 60 psi will go into 15 every time. And I like the dual circs for each zone. Turbo. It’s hard for us to determine if the xtank is sized properly unless we know the size of the whole system since system volume reflects xtank sizing. IF the x tank is sized correctly, and the psi on the tank set correctly the only other thing is a leaking indirect coil. It could be small. And leak differently depending on system temps expanding, and contracting the coil. I made an error on the piping layout. See Rev 2. The circ’s are only on the return side of the system. The system holds about 18 gal of water(10 gal of which is in the boiler). I will bleed off the residual pressure in the street supply which I did not do before. I want to make sure that when I bleed the pressure at the main water shutoff that also bleeds the pressure at the HW heater. If not I will need to figure out how to do that. Perhaps draining off a quart of water from the HW tank would do the job. The new X tank I installed is exactly the same model as I took out. The old one gave good service for many years, suggesting it is sized correctly. I hesitated to check the x tank pressure with a gage because doing so leaks a little air. The manufacturer warns you about the perils of checking. But the bottom of the X-tank sound empty when I tap on it. And it is brand new. My emitters are baseboard. I have an air scoop and no baseboard bleeder valves. Here is a sample of what I see for pressures at 1 hr. to 3 hr. intervals: 8,5,7,18,17. Most recently: 5,17,5,18,7,7,3,6,7,5, Also, I am using two gages that always agree. You guys think of things I wouldn’t have thought of. Thanks for that. Just shutting off the main and leaving a hot and cold open at a faucet will be fine. We've had a few new Xtrol 30 and 60 tanks recently that had the bladder literally stuck to the wall of the tank. IDK what they've changed, but the rubber adheres to the steel and won't allow any water acceptance into the tank. Maybe they're being made in China? I'd take the tank off, let the air out and try to depress the bladder with a blunt object like a socket extension. If you have trouble depressing it, you've found your problem. If you can free it, it shouldn't stick once it gets water in it. I will likewise verify an operational Xtank. I am beginning to think it has something to do with the banging which started the whole project. Somehow air is trapped and causes some kind of pressure build up as it finds its way out of the system. I don't know how to verify a good operating air scoop. Air will block circulation, but not cause a pressure build up. Much to the contrary, air would allow a place for the heated water to expand just like in a compression tank. Your relief valve wouldn't be dumping if it was air in the system. Is the pre-charge in the tank set to the fill pressure? Accurate gauges used for pre-charge and reading boiler temperature? Usually if you bump up the fill pressure you can hear and feel fluid going into the expansion tank.